Our lives are perennially suspended between the real and the digital worlds: we live our ordinary existences in the real world, engaging with family and friends, co-workers and neighbours, but some of us have created digital alter egos via their social media profiles and spend more time interacting with strangers, checking other people's feeds on Instagram, shopping, playing videogames or watching films online. At times the two realms - real and digital - meet and combine in unique ways as it happened a couple of years ago when Louis Vuitton featured in its S/S 2016 advertising campaign a virtual model, Lightning, the heroine of role-playing and storytelling game "Final Fantasy". As you may remember from a previous post, the ads also included real people such as Korean actress Doona Bae, rapper and actor Jaden Smith and models Sarah Brannon, Rianne Van Rompaey and Jean Campbell. At the time Creative Director Nicolas Ghesquière called Lightning a "genuine heroine", adding that the ad for the Louis Vuitton Series 4 campaign was where "reality and fantasy become one". In the last few years fantasy and reality have combined in new and extraordinary ways also thanks to innovative ways to communicate fashion and to computer-generated models and influencers such as Shudu and Lil' Miquela. Shudu, the sort of stunning beauty that a designer à la Yves Saint Laurent may have loved to see sashaying down his runway, looks like an elegant and exotic beauty with a super elongated neck. 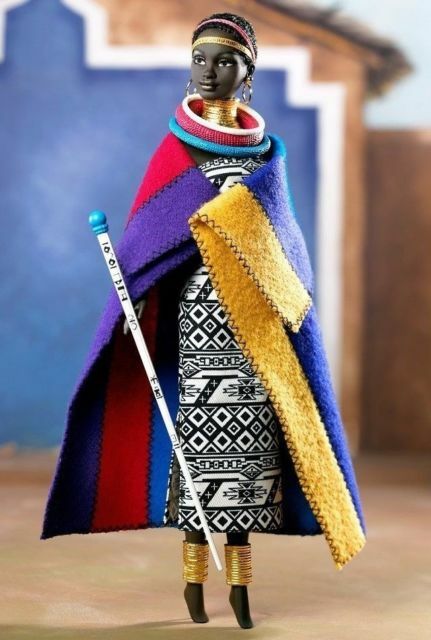 Her creator is British photographer Cameron-James Wilson who was inspired by iconic beauties à la Alek Wek and Nyadak "Duckie" Thot and by a Barbie called Princess of South Africa (View this photo). Shudu is extremely gorgeous and remarkably realistic, something helped by the fact that Wilson is a photographer and spent a fair amount of years retouching images via Photoshop. Wilson started working on Shudu at the beginning of last year using a programme called Daz 3-D.
Dressing Shudu is a time-consuming activity as her clothes must be digitised with a programme called Clo that simulates fabric: it took weeks to make sure Shudu could be clad in digital replicas of designs by Cushnie et Ochs, The Great Eros and Noon by Noor for a shoot on WWD, but the results were stunning. Wilson calls her "the world's first digital supermodel" and it is difficult to disagree with him. In February Shudu posed wearing a lipstick by Rihanna's Fenty Beauty and the company, thinking she was real, reposted the image (the repost was then removed). At the moment Shudu is enjoying more success thanks to a unique appearance with two Balmain-exclusive digital supermodels - Margot and Zhi, the latter allegedly inspired by David Bowie - in Balmain's Pre-Fall 2018 campaign. Shudu is not the only one who scored coverage on the fashion news and unique collaborations with a fashion brand: last February Prada collaborated with freckled model Miquela Souza, better known as Lil' Miquela a virtual 19-year-old Los Angeles-based influencer who often sports a double bun hairstyle, to promote the brand's A/W 18 collection in a partnership that included an Instagram takeover. There's differences between Shudu and Miquela: the former looks very real and seems to be more into fashion photoshoots; Miquela isn't as real as Shudu, she has streetwear cred and often looks like a character out of a video game à la The Sims. Miquela has posted on her Instagram account images that show her wearing trendy brands including Proenza Schouler, Diesel (check out the Deisel sweat), Supreme, Opening Ceremony and Vêtements, she produces music as well (see her track "Not Mine") and her life is connected with the existence of other characters such as male virtual influencer Blawko22 and Donald Trump supporter and right wing social media persona BermudaisBae (though she seems to have changed her mind recently regarding her political ideas...). Drama unfolded when in April Bermuda hacked Miquela's Instagram account in a blackmail attempt to push her to confess she was a robot. Behind Miquela there is Brud, the Los Angeles-based robotics and artificial intelligence startup led by DJ/recording artist/producer Trevor McFedries, that boasts notable investors including Sequoia Capital, BoxGroup and SV Angel. Both Shudu and Miquela's Instagram accounts aren't just growing in terms of followers, they are also making money for their creators: Shudu got the Balmain campaign; Miquela recently did a collaboration with musician Bauer, she has appeared in different fashion and trendy publication including Vogue and she's a muse to make up artist Pat McGrath. There are obviously pros and cons behind all this: the good thing about computer-generated icons like Shudu and Miquela is that they are unreal and this is the main reason why following them is infinitely less frustrating for consumers than staring at real and super perfect models or influencers engaging in fun activities, relaxing in a pool or showing the contents of their vast wardrobes. The other side of the coin is not so positive, though: as some people pointed out on Twitter, Shudu is a black model created by a white man, a virtual woman who may end up usurping the modelling jobs of real dark-skinned women. That said, when it comes to brand investments, virtual models may end up being a safer bet compared to real influencers and models: a virtual character is indeed not prone to embarrassing the brand it represents with reckless behaviour; a virtual character may cost less and may not ask for free gifts and, last but not least, being digital, it can be updated and radically transformed without an entire team of stylists, make up artists, assistants and photographers (but bear in mind that creating a computer-generated model is no mean feat for the artist doing it). The most interesting aspect of the virtual influencers is the fact that brands may come up with their own virtual supermodels, in accordance with their own needs. Who knows, maybe one day there will be more digital than real models on the runways. Time will tell, but there is something that plays definitely in favour of digital models and influencers: they are fictional characters, and technically and artistically fascinating works of art; being unreal they are not authentic, and right because they are not authentic they are more honest than real influencers. In the last few posts we have indeed seen a faux pas such as Dior's Saddle Bag-Gate that saturated Instagram with cookie-cutter images of influencers; then we explored the discrepancies behind the lifestyle of Italian influencer Chiara Ferragni and her companies generating very low profits. People like Shudu and Miquela may reveal themselves as anti-influencers, and end up being a refreshing alternative to real influencers, disclosing the collaborations they have with brands and fashion companies in a more honest way. Shudu, Miquela & Co are nothing new if you consider Japanese virtual pop star Hatsune Miku (who got her fashion moment when Riccardo Tisci at Givenchy designed a Haute Couture gown for her in 2016). Hatsune hasn't certainly replaced real stars and musicians, but she co-exists with them in the same world and has her own fanbase, which means digital models are here to stay. Will these pixellated icons of style usurp the jobs of real models and influencers? You can bet there will be more digital icons out there as copycats will start proliferating, so there is a tangible risk that some influencers will soon be out of job, unless they learn how to design impossibly cool virtual avatars and decide to retire leaving the spotlight to them.